The Clam Bangle is our idea of a true Cape Cod Bracelet. 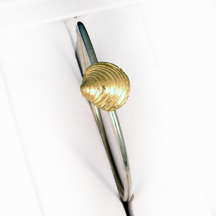 The two tone version has a 14k yellow gold quahog with a sterling bracelet and is priced at $300.00. Please call to order.